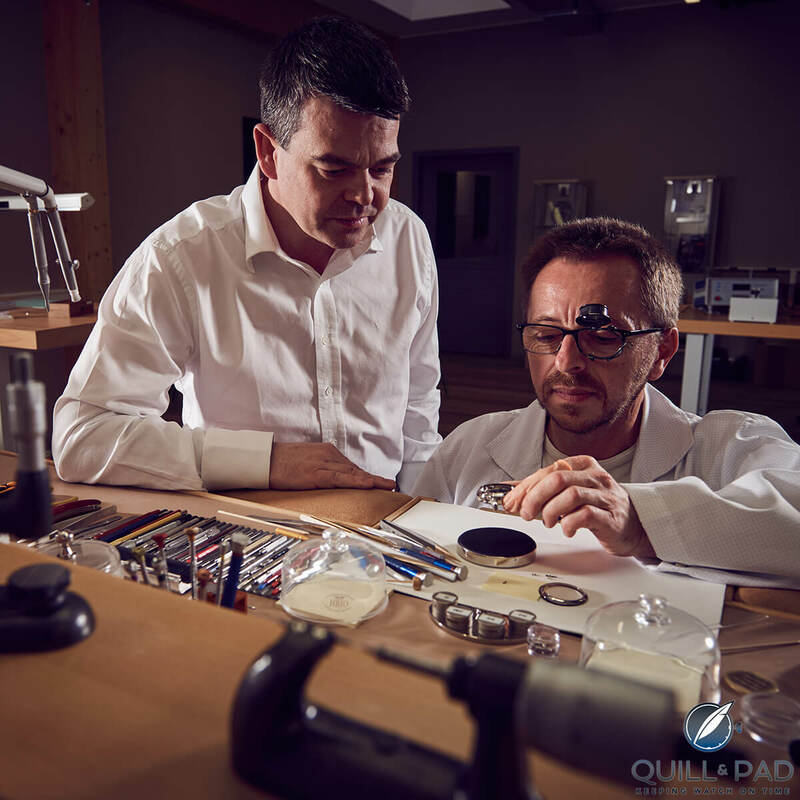 Romain Gauthier, the young owner and founder of the independent luxury watch brand of the same name, has worked in horology all his adult life: his first job was as a machine programmer/operator at a manufacturer of horological components in the Vallée de Joux. This fact is not inconsequential: it explains the basis for his vision of watchmaking, which starts with the “ingredients” of a watch: the components themselves. And indeed with Romain Gauthier’s timepieces we are talking about Alba white truffle pizza! Gauthier’s dream was to create his own brand, and he started by building the foundations of a true haute horlogerie manufacture. He bought crème de la crème machinery and hired highly skilled technicians and craftsmen to create a real in-house haute horlogerie workshop. The fact that Chanel, one of the most active saviors of unique crafts in the fashion world – which includes Lesage in the area of embroidery, Michel in millinery, and Barrie in cashmere knitwear – bought a “friendly” participation in this facility in 2011 (see Surprising Ties That Bind: Chanel And Romain Gauthier) speaks volumes about the level of excellence Gauthier’s workshop achieves. But it is only when you visit the manufacture with Gauthier himself and immerse yourself in the observation of his component manufacture that you can grasp the extent of the work done. The level of finishing of components coming directly out of the CNC machine is just outstanding, better than some “hand-finished” ones I’ve seen. I asked how he achieves this result. “Simple,” he responds: his CNC machine is the “Rolls-Royce” of CNC machines, costing in the neighborhood of 650,000 Swiss francs. But not only does he make sure to buy the best machinery, Gauthier’s long experience in very complex CNC programming is essential as he trains his employees personally. But it does not stop here. Every step of the component machining transpires with this obsession of excellence, with each step becoming an art form on its own. Profile turning (to make round components) and burnishing (compressing metal to increase hardness of components like pivots) are completed with Gauthier’s magic touch; the hardening process of metals (called trempe in French) is conducted in a vacuum environment to prevent not only alterations in color, but above all to reach the highest level of resistance. Once his painstaking work on components is complete, he can concentrate on the more “common” types of finishing on the movements, though it should go without saying that nothing is “common” with Romain Gauthier. If you need more convincing just look at Romain Gauthier’s superlative anglage. Gauthier is one of a small handful of watchmakers creating slightly curved chamfers for anglage, which is extremely difficult to achieve with consistency, and even offers double chamfered anglage on some models. “Anglage” is the term for a polished chamfer. At Romain Gauthier anglage is painstakingly carried out by hand only and the finish can take up to 20 hours for just one component! Where the majority of brands use sandblasting as a quick and easy machine-made finish, Gauthier uses the painstakingly slow, traditional hand sanding method because the result is visually superior: reflective sharp edges are not rounded. This probably explains why the Gauthier has been called the “spiritual son” of Philippe Dufour, one of the living legends of Swiss watchmaking and the watchmaker with perhaps the finest finishing in the entire industry (see Why Philippe Dufour Matters. And It’s Not A Secret). In terms of the watchmaking aspect, Gauthier is always looking for useful innovations in the purest sense of traditional fine watchmaking and is acclaimed by aficionados and peers alike. In 2013, his Logical One, with its multi-patented chain-and-fusée constant force system featuring ruby chain links, was awarded the highly coveted prize for best men’s complications watch at the Grand Prix d’Horlogerie de Genève. My visit of Gauthier’s exceptional and comprehensively-equipped workshop left me wide-eyed with emotion and filled with a peaceful sense of calm. The only regret is perhaps that he only produces 40 watches a year . . . and that I still need to save quite a bit to afford one. But that is what dreams are made of. For more information, please visit www.romaingauthier.com. Why does it look just like a Bovet????? It is probably the small off-centered dial that makes you say that, but apart from this feature, which is not particularly characteristic to Bovet, Romain Gauthier has his own distinctive character in many ways. Since Chanel bought into Romain Gauthier, technically it isn’t an independent anymore. Hope he can have the final say of things, though it would be difficult in a business world. My understanding is that Chanel has a minority stake in Romain Gauthier, which means that he retains control and makes the final decisions.